Last year’s treble winners went into the match in desperate need of the points after a torrid start to the season and they were celebrating at the end of a frenetic 80 minutes. Leeds were 18-0 up after 14 minutes of last year’s corresponding fixture and they stormed out of the blocks again on Friday night. It was a first five minutes to forget for Jack Owens, who kicked into the grateful hands of Handley and saw the winger gain field position for Jones-Buchanan’s try from Keith Galloway’s offload and then kicked the restart out on the full before Cuthbertson crashed over from close range. 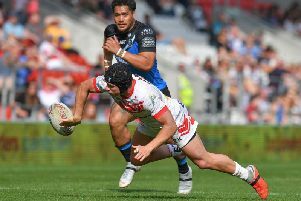 Amor gave Saints a lifeline by stepping his way under the posts in a repeat set forced by Walsh’s kick and then the scrum-half threw a dummy to score himself as the all-action start continued. Both sides looked as if they would score at every opportunity but the next try did not arrive until three minutes before the break as Walsh’s flat pass put McCarthy-Scarsbrook through a huge hole in the Leeds defence. It was a matter of time before the game’s next try and it was Leeds who got it when Handley collected Beau Falloon’s kick to dive over.